As you prepare for your holiday celebrations, show your support for our food and farming community and consider taking time to source local* food for your holiday meals this year. Thanks to the new Food Atlas, recently launched by Sustainable Connections’ Eat Local First program, it’s easier than ever to find locally produced foods. Create your menu using meats, produce and dairy products from local farms. The Food Atlas includes lists of farmers markets and grocery stores that feature local products. If you don’t have time to cook but want the fresh flavors of local food, check the Food Atlas for a list of restaurants that feature locally grown ingredients. When you go to holiday gatherings of friends or family give your hosts the gift of local flavor. The Food Atlas has a list of places to get locally made goodies that everyone will enjoy. The Food Atlas is a great resource for home cooks and food businesses alike. Here’s to a delicious holiday season for all! *Note: “Local” can mean different things to different people. 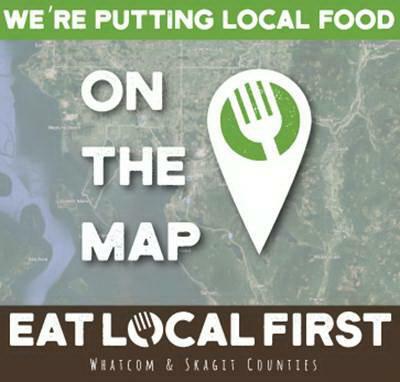 When we say “local food” we are referring to food grown within a four-county region: Whatcom, Skagit, Island, and San Juan Counties. This is the same definition used by Sustainable Connections’ Eat Local First program.